Brief Introduction: LIANGUAN RECYCLING Company is a professional manufacturer for design and production of waste Film washing recycling line&waste bottle washing recycling line, which is mainly used to recycle waste plastic PE PP waste bottles, PE PP waste films, PE PP Lumps and PE PP woven bags&jumbo bags. PE Bottle recycling line mainly includes belt conveyor, metal detector, crusher with water, floating tank, hot washer, high speed friction washer, centrifugal dewatering machine, drying system, storage silo, etc. Waste film washing line is independently-developed by our company on the basis of European technology. It is divided into belt conveyor, metal detector, crusher with water, floating tank, hot washer,high speed friction washer, centrifugal dewatering machine, drying system, cyclone silo and so on. Our company has a new type crusher specially designed for bottles. It can effectively crush the bottles and increase the output. The final size of the bottle is very suitable for the following washing line, and also save energy&labor. At the same time, it can be equipped with drum sorting system (can effectively sort the sediment and stone inside the bottle, protect the blade of the rear crusher without damage). The PE PP lump washing line can be designed according to the customers’ materials condition and the quality requirements of finished products. Our PE PP lump recycling line processing technique is very mature, high automation and output, less investment and manpower, low energy consumption, convenient operation and maintenance. Our PE PP recycling line has been sold all over the world. It’s very popular among all customers at home and abroad. LIANGUAN RECYCLING COMPANY customized integration of shredding, crushing and washing solutions, it provides complete PE PP PS ABS and other rigid scraps, including injection toys, daily necessities and packaging waste, bottle-shaped container waste, electrical waste, extruded pipe, lumps and others. LIANGUAN RECYCLING COMPANY PE PP lump recycling line also can be used in different levels of contamination materials, including PE PP film, PP fiber waste, waste film package scraps, life plastic waste, waste agriculture films, industrial packaging and waste films, Recycled material can be used for sales, granulation, injection molding, extrusion and blown film and so on. 1. The whole PE PP washing line is automatic controlling, compact process, high production efficiency, and nice cleanness. 2. 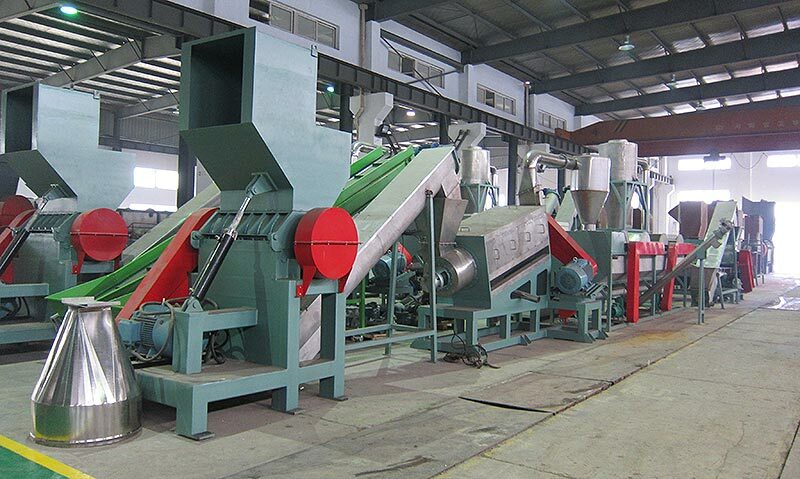 This PE PP recycling line can separate muds, sands, and other impurities from films and bags easily. 4. Provide centrifugal dewatering and squeezing technology. Usually our luxury PE PP washing line contains the following equipments, the specific configuration can also be adjusted according to customer requirement. Zhangjiagang Lianguan Recycling Science Technology Co., Ltd. has been in waste plastic washing recycling line for many years. The company has got the ISO9001,CE,SGS certification. LIANGUAN RECYCLING provides complete pe pp film washing line, pe pp lump recycling line solutions, such as belt conveyor, metal detector, single double shaft shredder, film crusher with water, floating tank, hot washer, high speed friction washer, special film squeezer or film densifier machine, centrifugal dewatering machine, drying system, storage silo, etc. including of water treatment and other machines which are suitable for waste plastic films, pe pp lumps, etc. A: As a professional manufacturer, we have been in PE PP recycling machine industry for more than 30 years, our factory is in Jinfeng Town, Zhangjiagang city which is near shanghai and wuxi. Q:How about the spare parts?